Shae D, Becker K W, et al. Endosomolytic polymersomes increase the activity of cyclic dinucleotide STING agonists toenhance cancer immunotherapy. Nature Nanotechnology, 2019. Han T-H, et al. 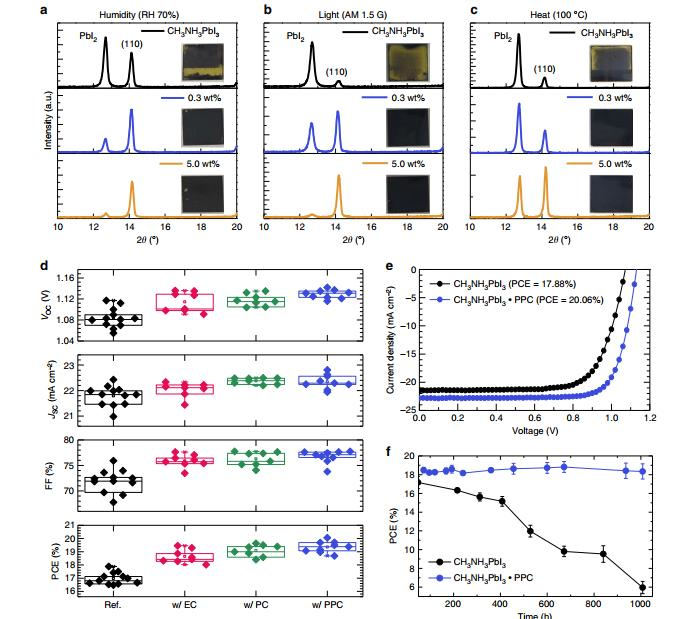 Perovskite-polymer composite cross-linker approach for highly-stable and efficient perovskite solar cells.Nature Communications, 2019. Vera-Hidalgo M, Giovanelli E, Navío C, et al.Mild Covalent Functionalization of Transition Metal Dichalcogenides withMaleimides: A “Click” Reactionfor 2H-MoS2 and WS2. Angewandte Chemie InternationalEdition, 2019. Wang S Z, Chen Y J, etal. DNA-Functionalized Metal-Organic Framework Nanoparticles for Intracellular Delivery of Proteins. Journal of the American Chemical Society, 2019. Niu Z, Huang S, Wan F, et al. A Self‐Healing Integrated All‐in‐One Zinc‐Ion Battery. Angewandte Chemie International Edition, 2019. Wu C, et al. Ultra-high Durability Perovskite Solar Cells. Nano Letters, 2019. Sun Z Y, Cheng K, et al. Controlled Nano-BioInterface of Functional Nanoprobes for in Vivo Monitoring Enzyme Activity in Tumors. ACS Nano, 2019.